Stacy Tilton Reviews: Gourmet Gifter - Your one stop shop for unique snacks! Gourmet Gifter - Your one stop shop for unique snacks! Gourmet Gifter is a fairly new business that offers a nice variety of unique snacks. I don't know about you, but sometimes I get tired of the same ole snacks day after day. And of course I'm always up for trying something new so I was very excited when I was contacted by Gourmet Gifter to try some of their new line of products. I was sent a bag of Chili Cheese Puffs as well as a bag of Salty Sweet Addiction Kettle Corn. I opened them both up when we had our family game night and it gave us all the opportunity to try them both. I really liked the kettle corn a lot, it had a nice sweet kettle corn taste to it that wasn't super sugary or too salty. I like that they actually kettle pop and hand sift the popcorn. It gives it that authentic kettle taste, and because it's hand sifted you don't end up with a bag full of un-popped kernels and small pieces in the bottom of your bag. 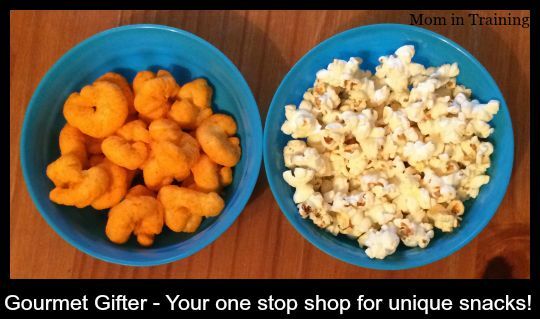 My kids really enjoyed the Chili Cheese Puffs, they liked the combination of cheese and spices mixed together making it different than any cheese puffs you find in the store. I was also sent their PurEarth Meal Replacement Bar in pineapple. I actually passed it onto my husband because he loves everything pineapple and sometimes at work doesn't have time to stop for a full lunch. He said he loved the flavor and the texture of the bar and it didn't remind him of other meal replacement bars we had purchased before. This was good to hear because I like to give him something to keep in his locker for those busy days so he doesn't just skip a meal. Buy it: You can order form the Gourmet Gifter website anytime day or night. Right now when you place your first order of at least $30! You will receive 3 large bags of Colby's Kettle Corn ($12 value) for FREE! Just use promo code FIRSTORDER at checkout. Very interesting!! I have never heard of them before but I love anything unique!! That chili cheese puffcorn sounds amazing!! I will have to check them out!! I will have to check out this site and see about their products. the Pineapple meal replacement bar sounds amazing and something that I would love to try! Yum! I'm always looking for new snacks! The Chili Cheese Puffs look delicious! That might be my new favorite snack! I just got my second box from them today! I am so excited to share the new items with you all! I love the idea of taking things everyone loves, like popcorn and making them more unique. It's a great way to get people to try new flavors especially kids.